At the Sutton Council Meeting held on 19 January 2015, Councillor Neil Garratt (Beddington South, Conservative) tabled four questions, two of which had cycling themes. The first of Neil’s cycling-related questions, to be discussed here, concerned the Outer London Fund regeneration project around the shopping area on London Road (A237) in Hackbridge [Open Street Map | Google Maps | Street Map] and whether consideration had been given to the provision of dedicated space for cycling during the consultation and design stages of the scheme. The second question related to the standard of the cycling infrastructure that was being proposed along Green Wrythe Lane in Carshalton, and whether this was indicative of the type of infrastructure that could be expected elsewhere in the borough. To read about this, see Green Wrythe Lane – one year on. Both questions were timely and useful, but the replies received to the Hackbridge question in particular, and to the corresponding supplementary question, raised more questions than they answered. In this post I delve a little deeper to try to unravel things a bit. The conclusion I reach is that the simple answer to the question is “no”, dedicated space for cycling was not seriously considered (although some stakeholders had indicated that this would be a good thing over a number of years), and that the reason for this was that kerb-side space for parking (a priority for traders) took priority over space for cycling. London Road, Hackbridge (around 3.40pm on Friday, 6 March 2015). Has the Heart of Hackbridge project succeeded in managing contested space? Who benefits the most now that the scheme is complete, and is this district centre now a more cycle-friendly place to visit? Could the relevant lead member explain whether, when the road scheme was designed for the Heart of Hackbridge Outer London Fund project, any schemes were considered which included space for cycling? If so, why was this not included in the final design? If no space for cycling was ever considered, why not? As part of the development of proposals for the Heart of Hackbridge scheme, officers ran a number of targeted consultations with specific groups to help shape the scheme. One of these consultations was with the council’s Cycling Forum and was attended by representatives of Living Streets, the London Cycling Campaign and Cyclists Touring Club. There was a good debate at the Forum meeting about provision for cyclists and about the differing needs of competing users of the area (pedestrians, cyclists and drivers), the need to maintain parking provision to allow for stop and shop parking to support small businesses in the Hackbridge centre, and the actual amount of space available. There was discussion about the need for a dedicated cycle lane, the problems of segregated cycle lanes in general and the need to widen the footway to allow for improved facilities for pedestrians and create space to run events in the centre (i.e the Artisan Market run last summer). On balance, representatives of the Forum felt that the proposed design (which did not include cycle lanes) would improve the safety of the junction by significantly reducing traffic speed and that this would be a benefit for those cyclists who like to ride with the traffic. For cyclists not content with cycling with the traffic, the representatives requested that Elm Road be made a contra flow for cyclists. The council agreed to this suggestion which has been implemented as part of the proposals. Finally, representatives at the Forum requested cycle stands on each of the three arms of the town centre. The newly widened pavements have allowed for this. The notes of the Cycle Forum meeting are available on the council’s dedicated Heart of Hackbridge web page should anyone wish to view them. Cycle Forum consultation – a fait accompli? My first impression on reading Councillor Whitehead’s reply was that it was disappointing, and perhaps a little disingenuous too. Rather than directly answering the first part of Councillor Garratt’s question, as to whether any schemes had actually included space for cycling in the design phase, her reply focuses on one particular informal consultation. This could give people the impression that it was the cycling representatives who attended the council’s Cycle Forum on 2 May 2013 (including myself) who were largely to blame for space for cycling not being included in the final design. It is true that one cycling representative in attendance at the Cycle Forum meeting said that lack of dedicated space was effectively not a problem, because “cyclists” could take the lane, speeds would be slower anyway, and the less confident could ride on the pavement. This probably explains why Councillor Whitehead’s reply refers to “those cyclists who like to ride with the traffic” and “for cyclists not content with riding with the traffic, the representatives suggested Elm Road be made a contra flow for cyclists”. (Incidentally, on this latter point, although a contra-flow is welcome on Elm Road, the contra-flow here will provide absolutely no benefit for anyone cycling north-south through Hackbridge along London Road (A237). In the big scheme of things it is almost an irrelevance). “SB explained that in an ideal world there would be space to meet all users’ requirements but that following strong feedback from the community the scheme has been designed to reduce traffic speed and provide space for pedestrians. In addition, the scheme needs to support local businesses and the traders had emphasised the need for stop and shop parking. Consequently, a decision had been made not to include dedicated cycle lanes.” [My emphasis in the last sentence. SB = Sally Blomfield]. So there we have it: “….the decision had been made not to include dedicated cycle lanes”. The cycling representatives could not change that. Consequently, the Cycle Forum meeting, which is central to Councillor Whitehead’s reply, cannot be described as being either an opportunity or a consultation to develop proposals for cycling in Hackbridge. Effectively, cycling representatives were presented with a fait accompli. Therefore, it was not very helpful of Councillor Whitehead to cite the Cycle Forum meeting as the basis of her reply. The notes to the Cycle Forum meeting, or “Go Early consultation”, can be downloaded from the link below. At this point, although not specifically related to the Hackbridge project, I think I should also comment on the discussion notes set out under item 2 of the Cycle Forum notes. “There was a general discussion about meeting the different needs of different cyclists – confident cyclists and young people or those less confident…”. It is rather worrying that the idea persists that there is a requirement to provide different types of cycling provision for different types of cyclists. This is not, of course, how it works in countries with high levels of cycling. In the Netherlands, for example, cycle tracks are not there as some sort of fob to the squeamish. Everyone uses them, and everyone enjoys using them, because they are designed to a high specification and so bring tangible benefits to everyone. They are, of course, great for young people, for the elderly, for people who find mobility difficult, and for those who use adapted bikes. But here is the thing, segregated cycle paths can be absolutely brilliant for the commuting and experienced cyclist too (with the caveat that they are designed properly, of course). Imagine not having to queue in slow moving traffic on the carriageway, but instead having your own dedicated, all clear ahead, path. Imagine having priority at junctions. Essentially, imagine being an experienced cyclist, and really enjoying the experience. That’s what safe space for cycling is all about. It’s about cycling for everyone, and it’s about cycling for those practical, utilitarian purposes, so trips to school, work and the shops, as well as purely recreational. So why wasn’t dedicated space for cycling designed into the Hackbridge scheme? This extract from the Cycle Forum meeting notes: “…the scheme needs to support local businesses and the traders had emphasised the need for stop and shop parking” helps to explain why dedicated space for cycling was not designed into the scheme. This reflects the notes that I jotted down at the time of the Cycle Forum meeting: “Not Dutch, no segregation, nothing for cyclists”; “No chance of cycle paths due to requirement of car parking on pavement”; “Traders say they don’t want to loose any parking places”. So, when Councillor Whitehead talks about “problems of segregated cycle lanes in general”, and we wonder what these problems are, (again, the Cycle Forum notes help as they declare that these problems are to do with the tracks not being cleaned or maintained, which really should be easily addressed and should not be a problem at all) perhaps what she is actually saying is segregated cycle lanes are a problem because they take up space that could otherwise be used for parking. The debate over “the need to maintain parking provision to allow stop and shop parking to support small business in the Hackbridge centre” was not generally had at the Cycle Forum meeting (although this idea was reinforced by another cycling representative who considered the ability to be able to park a car right outside a shop an absolute necessity). The debate had already been had with traders during earlier targeted consultations, and it would appear that it was the traders who had emphasised the need for stop and shop parking. This is a theme that is taken up in Councillor Garratt’s supplementary question. Could Cllr Whitehead confirm that residents were never offered alternative designs for Hackbridge which included space for cycling? More broadly, is it this Council’s general approach to street design in town centres to prioritise “stop and shop” car parking over space for cycling? Is there an example of space for cycling being given priority over town centre “stop and shop” parking? I can confirm that the council does not have a ‘general approach’ towards the design of schemes in town centres but rather the scope of each project is determined on the basis of local community (residents and businesses) needs and priorities; funder’s objectives; and the capacity to meet a broad range of often competing needs within the constraints of the individual town centre. This is often a very fine balance given that the majority of our schemes are retro-fitted within our largely built up suburban context. In the context of the Hackbridge Project, a number of consultation events were held between November 2012 and June 2013. The earlier events looked at concepts and possible options and helped the Project Team identify priorities. The later consultations were much more focused on getting views about a more detailed scheme. The extent and variety of consultation events and the summary of results from the early consultations is set out in the Consultation Report, dated March 2013, which is available on the Council’s web page www.sutton.gov.uk/outerlondonfund. This summarises what people disliked about Hackbridge (as a town centre and the junction) prior to implementation of the scheme and identified priorities for improvement. From the early consultations it was clear that residents’ priorities for the Project were to make it feel like a ‘place’ rather than a traffic dominated through route. This resulted in preferences for improvements to the pedestrian environment; improvements to the quality and appearance of the shops; and measures to address traffic speed. Residents also clearly expressed a view that the area would benefit from soft landscaping and positively supported street trees. Over 50% of respondents identified these issues as priorities. Whilst cycle routes and cycle parking were identified as issues they were flagged up as priorities by less than a fifth of the respondents. In addition to this the priorities for the scheme set by the primary funding body, the GLA, were to enhance the local retail centre of Hackbridge and the need to implement a range of interventions to help support local businesses. Traders’ gave a very clear steer at the traders only consultation events about the need to improve the parking arrangements in order to help support stop and shop activity. There was considerable consultation over the parking strategy. The impact of the Project has been to change the characteristics of the road and junction with Hackbridge Road to increase its ‘Place’ function. Chapter 1 of the London Cycle Design Standards manual advises that the degree of segregation appropriate between cyclists and motor vehicles varies by street characteristic. As the ‘Place’ characteristics become more important, the standard recommends less segregation. This accords with the current scheme where cyclists share the carriageway with lower speed motor vehicles. As previously advised, for cyclists not comfortable with cycling with the traffic, Elm Road has been made a contra flow for cyclists as part of the proposals. So what does Councillor Whitehead’s response to this supplementary question tell us? Councillor Whitehead’s reply to these supplementary questions really just reiterates the points already made about the priority given to parking at the expense of cycling infrastructure, and how this ties in with the traders’ views on the link between parking and business. Whether the Hackbridge traders had made a case for this change in parking arrangements prior to the scheme is not known, but these changes are probably linked to “the need to improve the parking arrangements…”. We will come back to parking, again, in a moment. The fact that cycle routes and cycle parking were noted to be issues and “flagged up as priorities by less than a fifth of respondents”, simply reflects the situation were only about 1% of trips in the borough are currently made by bicycle. It could be argued that, given such low levels of cycling, a level of interest that was less than a fifth of respondents is actually quite significant. It certainly is not a reason to dismiss it. That situation will not change unless cycling is seem as a serious transport option by Sutton Council and is enabled, as well as promoted. Again, Councillor Whitehead’s reference to the contraflow for cyclists on Elm Road, at the end of her reply, is unhelpful. The question remains, were residents offered alternative designs for Hackbridge that included space for cycling? There may be a clue contained within the document that Councillor Whitehead refers to as Consultation Report (March 2013). Although, at the time of writing, the Heart of Hackbridge Consultation Feedback report (March 2013) appears to be no longer available on Sutton Council’s website (or if it is, is not so easy to find), a web search for “heart of hackbridge consultation feedback” should find it or, alternatively, the document can be downloaded directly from the link below. (In January 2015, the document had featured as the sixteenth, in a rather random looking list of 22 documents, on the page given in Councillor Whitehead’s reply. The document is also currently still available from One Planet Sutton). This Consultation Report tells us that the outline proposals and initial design concepts were generally made available to the public for the first time at a series of events held between August 2012 and March 2013. It also provides feedback to the proposals from various stakeholder groups. BioRegional, for example, had something to say about cycling (Section 5.4): “Designated cycle lanes make it safer for cyclists and pedestrians alike, encouraging those that can, to cycle rather than drive to their local centre”. This could perhaps suggest that the provision of cycle lanes were originally included outline proposals. There is further reference to cycle lanes in Appendix C of the report, which usefully provides the full response from the Neighbourhood Development Group, and this begins “The NDG feel that the public realm improvements captured many of the aims and policies of the neighbourhood plan particularly in improving cycle lanes and the quality of the footpaths in front of the parade of shops”. Section 5.3 Local Traders: “The greatest priority for the traders is increasing the amount of parking and also ensuring controls are in place to prevent commuters, who do not use the shops during the day, from taking up lots of the parking spaces so that customers cannot use them. Limiting the amount of time that people can park along London Road to say two hours has been suggested as the best way of doing this.”. We now know that, as part of the scheme, the amount of parking provided has been increased and, very sensibly, controls have been put into place to prevent commuters parking in these on-road spaces all day. What the Consultation Feedback report does not tell us, unfortunately, is exactly what the proposals were that were being presented during this period. At the public exhibition held at Centrale in Hackbridge Corner during February 2013, a series of twelve presentation panels, with the tagline “A strategy for improving the local centre”, were on display. It is rather surprising that these drawings appear not to have been made available since, as these would have helped Councillor Whitehead provide a fuller response as to whether residents had been offered alternative designs for Hackbridge that included space for cycling at this time. Nevertheless, the Consultation Feedback does appear to indicate that between 2009 and 2013 there were greater aspirations for cycling in Hackbridge than were ultimately delivered. And really we were right in thinking that space for on-street parking was ultimately considered to be the priority over off-street parking and space for cycling. Of course, broader plans for Hackbridge, as a centre of sustainable excellence, were established a few years prior to the 2013 Heart of Hackbridge consultation. The Summary Report on Public Consultation on the draft Hackbridge Masterplan (May 2009), which, again, is a document that reports on the consultation process but does not detail the proposals being consulted on, includes under Pedestrian/Cycle: “A number of respondents highlighted the benefits of separating paths from roads where possible, and creating a legible, safe and convenient, interconnected network of cycle/ ped paths throughout Hackbridge”. There is also an officer comment: “Pedestrian/ cycle access is a priority of the draft masterplan which will be carried over to the next stage of review and development plan development”. So where did that go wrong? Perhaps The Hackbridge Masterplan, Appendix B, Transport, goes someway to providing an answer. Although it notes that “Many European towns / suburbs achieve upwards of 30% cycle mode share, though have been planning around the bike for decades and use of bicycles has always been greater than in British culture”, the document majors on cycle parking provision. Nearly a whole page dedicated to the subject, but other cycling infrastructure does not get a look-in. Clearly, the ability to be able to park a bicycle, as securely and conveniently as possible, is important. But that alone is not the panacea to get many more people on bicycles for some of their day-to-day journeys. How well informed is the consultation process? All of this raises some questions not only about the design of the schemes, but also about the consultation process. Were traders, for example, when consulted about the Heart of Hackbridge scheme, made aware of the Core Planning Strategy, or the wider objectives of environmental sustainability, when they were consulted? Clearly traders are running local businesses, they have livelihoods to support, but did anyone from the Council say “look, we are going to help you here, we will ensure there is adequate parking but we want to have a different approach in Hackbridge and so we wish to enable many more local people to access your shop by foot and by bicycle too?”. Has anyone carried out research to see exactly how dependent local centre traders are on “stop (and park right outside) the shop” as opposed to “stop (park nearby) and shop” business? Would there be significant changes to footfall, in the short term, medium term or long term if changes such as these were introduced? Could Hackbridge traders have more to gain from being located in the first local centre in the borough to be fully accessible by a stress-free, suitable for 8 to 80 years olds, bike ride? Surely these are the sort of questions the Council needs to be asking, the sort of research that needs to be commissioned, especially if there are aspirations for Hackbridge to become an environmentally sustainable suburb? What actually looks like happened is the Council acquiesced. 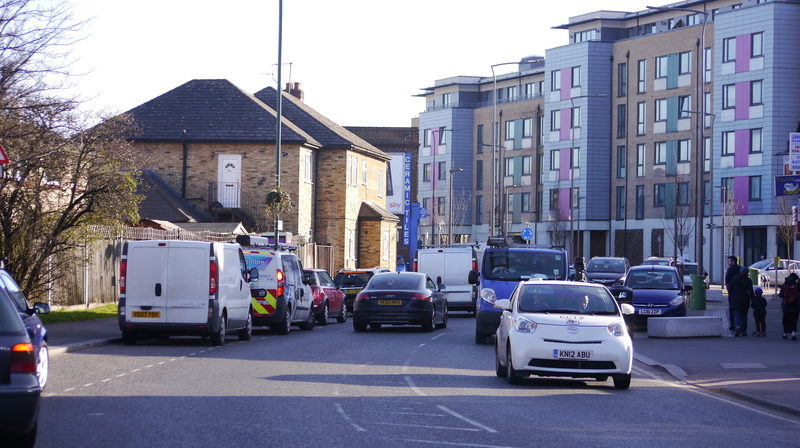 It might be that the businesses currently trading on London Road are dependent on people driving past and happening to see a parking space for their livelihood. Although, if this is the case, perhaps a shop operating out of a caravan parked on the verge of Mitcham Common a kilometre or so to the north of Hackbridge (subject to planning approval of course) would be a more profitable operation. But at least let’s do the research and find out. In the meantime, perhaps all future council policy statements should have some sort of caveat stamped across their front cover along the lines of “Don’t worry, none of the policies outlined within will result in the loss of kerb-side parking”! Kerb-side parking is a must for local shops – fact or myth? Surely the traders themselves are the best judge of their business? They know who walks into their shops, and whether they arrived by car, by motorbike, by mobility scooter, on foot, or by bicycle? You would think so, but there is some evidence to suggest that this is not necessarily the case. Research carried out by London Councils in 2012, looking at the link between parking and urban centre success, found that more parking does not necessarily mean greater commercial success. Furthermore, the report notes, shopkeepers consistently overestimate the share of their customers coming by car. In 2013, research commissioned by Living Streets, and presented in their report The Pedestrian Pound, demonstrated that investment in walking can deliver a commercial return and much needed boost for high streets. The sustainable transport charity Sustrans questioned the assumption that free parking was positive for local high streets in October 2014. Chris Boardman, former Olympic cycling champion and policy advisor to British Cycling, had referred to some of this evidence earlier in the same year in an article in The Times “More cycle racks and less parking will revive struggling high streets’’. Chris is quoted as saying: “Stats show cyclists spend less per visit, but they visit more often”, adding that “it isn’t anti-car, it’s pro-people”. Perhaps in Hackbridge it’s the locals who spend less per visit, but visit more often. Perhaps they just drive to shops rather than walk or cycle. But if it’s people in cars who the traders are keen to woe, isn’t there the danger that Hackbridge people will get in their cars and drive somewhere other than Hackbridge to do their shopping? As an aside on parking, it is worth taking a look at the Road Markings and Signage Drawing that accompanies the Heart of Hackbridge proposals, originally available as “Heart of Hackbridge Parking Scheme”. This drawing, dated July 2013, and produced by Stockley, covers an area of approximately 350 metres north-south by 300 metres east-west. It shows a sea of signage associated with motor traffic movement (or non-movement), but includes just three signs that are specifically for cycling (one directional, and two “except cycles” plates). Can you spot them? These cycle signs are a nod towards the handful of people who are prepared to cycle into Hackbridge each day. Meanwhile, the two “Welcome to Hackbridge, please drive carefully” signs are a nice touch for the motorists who drive along the A237 (around 19,000 vehicles each day, according to figures from the Department of Transport). With a maximum speed limit of 30 mph, and a minimum of one hour of free parking, what is there not to like? Presumably, driving and parking is what one does in Hackbridge, and from the look of things that’s how it is going to remain. “Road Markings and Signage” diagram showing proposed new signage as part of the Heart of Hackbridge proposals, taken from the Heart of Hackbridge Parking Scheme. Try comparing this with a satellite image of Hackbridge to see if there is anywhere else nearby that suitable for parking. It is just a pity really that a more holistic approach had not been taken with the Heart of Hackbridge project, an approach that could have facilitated improvements to parking whilst at the same time building in the first stages of transformative cycling infrastructure. Here we have a regeneration project in Hackbridge that is about attempting to make the retail area more attractive, somewhere that people living locally will want to go to, where people will spend more time and money, and talk to their neighbours and dwell awhile. But it is delivered with a parking strategy that is essentially continuing to promote the idea of drive-thru facility (which, to be honest, is probably what London Road Hackbridge has been for many years). There is no doubt that the common factor in both the Hackbridge and Green Wrythe Lane schemes is the conflict between space for cycling and space for parking. Hackbridge is aiming to be the borough’s first sustainable district centre. For that to be achieved, cycling and walking to the centre has to feature strongly. Perhaps, by the time of the next reiteration of Hackbridge, in say 15 years time (so,17 years after the Mayor of London published his ten-year Vision for Cycling with £900m funding, £30m of which has been allocated to neighbouring Kingston to help deliver it), it will have been recognised by Sutton that dedicated, high-quality, space for cycling is essential to make cycling feel like a safe and attractive option. Unfortunately, this is unlikely to come in time for those born before 2015 to be able to enjoy an independent cycle ride in Hackbridge whilst they are still in childhood, or for anyone who is currently 50 or over and would like to be able to cycle gently to the shops in their retirement. The Roads Task Force report (July 2013) notes that “the most challenging streets and roads are those where demand for movement and place are both very high”. This could apply to centres like Hackbridge (but also St Helier, Cheam Village, Wallington and others in the borough), although in the Hackbridge case, endeavouring to emphasis the place function (with arguably relatively low demand, although growing) when the movement function (with high demand) dominates, is particularly tricky to say the least. Change will take time, but it has got to start somewhere. Would it be too unfair to say that the HoH project was effectively a missed opportunity by the council to lead the way on sustainable transport delivery? Of course, it’s also unfortunate that the Space for Cycling initiative, and Get Sutton Cycling for that matter, came too late for the Heart of Hackbridge project. The Space for Cycling theme for Wandle Valley (i.e. 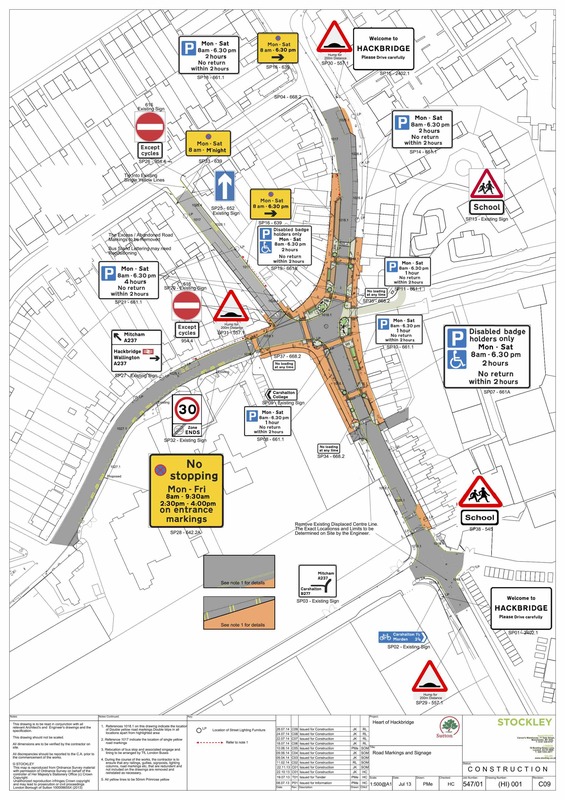 Hackbridge), agreed in March 2014, is ‘Cycle friendly town centres’, and the ‘ward ask’ specifically requests the provision of protected space for cycling on London Road. If the HoH consultation had taken place after this ‘ward ask’ had been requested, and the same outcome had transpired due to a fait accompli scenario, the idea that “on balance… the proposed scheme….would be of benefit for those cyclists who like to ride with traffic” would have been laughable. So what does all this tell us? Even with strategies in place, the road ahead is not going to be an easy one. The case has to be made, and a plan formulated that will deliver a vision and take everyone along with it. The forthcoming Cycling Strategy for the borough must be clear with its objectives, recognize the challenges, and look to the long term, if it is to be ultimately successful in delivery. Obviously there needs to high levels of funding, but the current lack of funding need not be a reason to think like we have always thought. Those tasked with delivery in Sutton need to look again at what is happening elsewhere and understand what makes cycling really attractive. Ward councillors, and borough MPs, need to understand this too, because getting more people interested in cycling can only be a good thing for so many reasons. It’s time for aspirational thinking. Our thanks again to Councillor Garratt for tabling these questions at the full council meeting, and to Councillor Whitehead for the responses. This debate has helped capture current thinking on cycling in Sutton (which, in 2015, continues to disappoint to a very high degree), but at the same time has helped put cycling further up the local agenda (so potentially bodes well for the future). Cycling is, at last, being talked about in the borough. Let us hope that sooner rather than later it is recognised that providing transformative Space for Cycling can ultimately benefit everyone. ‹ And then there were ten! Well done Charles, putting in so much research and uncovering lots of information about how we seem to have been misled over cycling provision in Hackbridge. I wrote to Sutton Council airing my concerns about planned narrow road lanes and how these might hinder safe cycling. The response was a batch of lengthy pdf planning documents. One key paper by the contracted architects did not even mention cycling through all twenty pages of text and dreamy drawings. It did however open with the notion that road users should not be put in conflict with each other. But I see nervousness etched on the faces of cyclists and pedestrians trying to determine what car and lorry drivers are about to do! Another set of consultation questionnaires showed different questions about cycling asked in the first and the follow-up questionnaires. The first asked about ‘provision’ for cycling, the second about ‘requirements for cycles’ (I paraphrase from memory) suggesting that the priority had been changed between the questionnaires eg from cycle lanes to cycle furniture. Unsurprisingly the first questionnaire elicited more favourable responses from residents compared with the second: more people wanted cycle lanes than cycle racks. I was also told that the pavements would be permitted for cycling. But no Traffic Enforcement Order seems to have been invoked nor is it practical due to obstacles (including cycle racks!) on the pavements and different heights of pavements and side lanes. There have been scores of complaints about the informal pedestrian crossings which are due to be replaced and which I think is symptomatic of the hopeless approach Sutton Council has taken over the whole process.